I finally decided to take the plunge and try one of the Olivon 70 deg eyepieces Don is carrying. This is one solid eyepiece. I tried first light under poor conditions last night. I will try again tonight but clouds are threatening as the Sun sets. Congrats. I'm looking forward to learning more about your thoughts on this unit. Especially compared with the ES 68 20mm which I own. Looks nice! Looking forward to your reports. 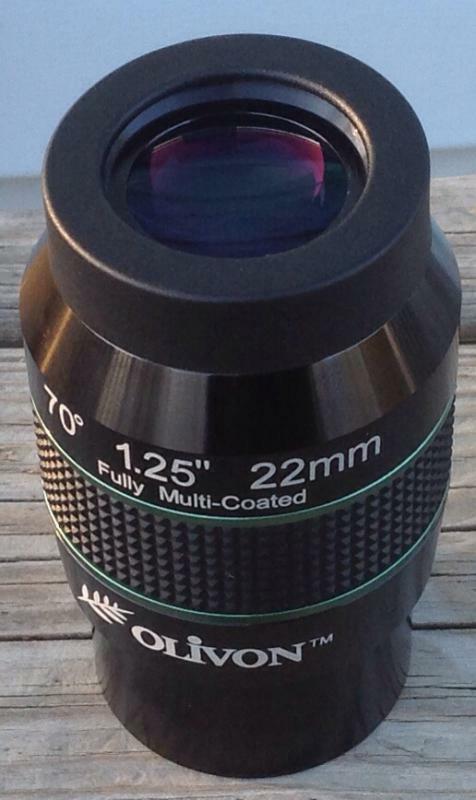 Isn't that the same as the Celestron 22mm Ultima LX in a different outer casing? It looks bigger than I would have guessed. I compared the 20mm ES68 with the 22mm Olivon on the Moon using a 2.4x Dakin barlow and an extension tube so that both eyepieces were at 96x. The Olivon was as sharp as the ES68 on the Moon. I actually found the Olivon more comfortable. The eye seems to more naturally find the sweet spot and the field stop is more easily seen once the sweet spot is found. The Olivon has a sharper field stop. Unfortunately, the skies were not the greatest in terms of turbulence. with extension tubes and the Dakin barlow I had the 22mm Olivon at 120x, but the skies never gave those really crisp moments. But I was able to see the the Olivon is easy to use without blackouts, has a nice presentation and I see the cool tone that Don has mentioned. 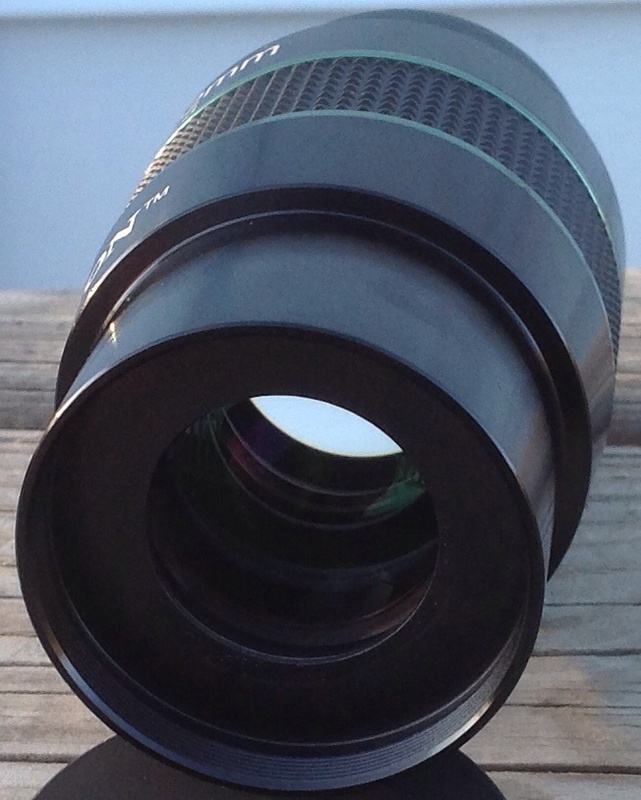 Stars seem very vibrant in this eyepiece. If under moonless conditions it has minimal edge of field brightening it will be a real winner. If clear skies hold, and if I wake up in the night when the Moon has set, I may sacrifice an hour of sleep to check it out. Sounds like a decent eyepiece so far. I've been eyeing the 17 and 13 for a little while now but have hesitated given the lack of available reviews (and also that the 2" 22 is mislabeled as a 1.25" eyepiece, not exactly confidence inspiring). I'll be curious how these perform under better conditions. Thanks for taking one for the team. I got up at 3:15am. No clouds or moon so I was able to really test for EOFB. The 22mm Olivon has very very mild EOFB. It is not a distraction and I didn't even think I was seeing it continuously. That is very good news because many otherwise excellent eyepieces have turned out to have too much EOFB for my tastes. Had some real nice quick looks at a few summer showcase objects: M27, M71, M8, M17 ... And so on. When the scope finally cooled for the last 20min I was out the 22mm Olivon started to show the stars as tight pinpoints rivaling the ES68's - which themselves rival the 19mm Pan. This eyepiece is not prone to blackouts at all. It is very comfortable and natural. I'll be keeping my eyes on this thread, for sure. The big question in my mind is how it compares to a 22mm Astro-Tech AF-70 or a 22m Vixen LVW. I tried the 22AF-70 in an f/5 refractor, and it was pretty sharp to about 85% out from center, with a little bit of off-axis astigmatism and field curvature. A borrowed Paracorr on my 12" f/4.9 cleaned up the edges almost to perfection. How does the 22OL-70 do in terms of contrast, edge sharpness and lateral color? What about eye relief for glasses wearers? That answer will vary, since different glasses wearers have different requirements in that regard. But it has a large "effective" eye relief, which is what counts, just like the TeleVue Delos, Pentax XW, Baader Hyperion, Vixen LVW, and several other 70 degree eyepieces with long eye relief. The AT AF70's extra-stiff eyecup reduces its effective eye relief, though it can be removed or folded down. I would think very few eyeglass wearers would find the eye relief too small. I would put the eye relief at about 17mm above the eyecup when the eyecup is rolled in all the way, and 20mm from the lens. It is a little heavier and longer than my 28mm ES68 but also a little narrower. It handles very nicely and ... no undercut! I think based upon what I've observed so far you can have high confidence in the quality of construction. It matches the ES68's in that regard. Another nice feature is that the top cap and the bottom cap are both 2" so it doesn't matter which end you put the cap on. That's the sort of little thing that costs nothing at all. I'd like to do more observing before I comment on contrast - but it did not strike me as having poor contrast. As for edge performance - it performs about the same as the ES68 in my refractor. When I barlowed the 22mm Olivon to the same magnification as the 20mm ES68 on the Moon, the Olivon was actually better at the edges. I did see a tiny bit of lateral color right in the last 2% of the field near the field stop - the least lateral color I've ever seen and yet noticed. The 19mm Pan has more I think. Glare was not a problem on the Moon. There was some kind of coating glint or reflection. Here is what I saw: When I looked at the Moon and the lit portion was off the center of the field there was a purple/green spot of reflection of some kind. It was not shaped like anything and flared around the very center slightly as I moved my eye. It seemed like it could have been a reflection off my eye or some kind of coating reflection. When the Moon was centered this reflection could not be seen and it was of no consequence for lunar observations. I think it will definitely depend upon your eyeglasses. My new glasses have a more curved shape and seem to require several mm more of eye relief than my old glasses. I can see the full field without contact with the top rubber surface, but small movements will sometimes bring light contact - so Don's 17mm estimate seems right to me. The rubber sleeve that goes over the twist up eyeguard can be removed and this gains another 1-2mm of eye relief. When I removed this rubber sleeve the eyepiece was completely comfortable with my glasses off. This sleeve removes and resets very easily. Note - I don't need to remove the sleeve to comfortably use my glasses, but removing it makes it even more comfortable. Yes - I think some real thought went into the specifications of these eyepieces. Identical caps on both ends, no safety undercut, excellent internal blackening from what I can tell. Internal surfaces seem dark and I can see at least one internal baffle. FWIW I believe this may be a factor in why the eyepiece seems to have very little EOFB. The quality of the annodizing is outstanding. The eyepiece has a very rugged feel and the coatings look really nice. I really can't say. 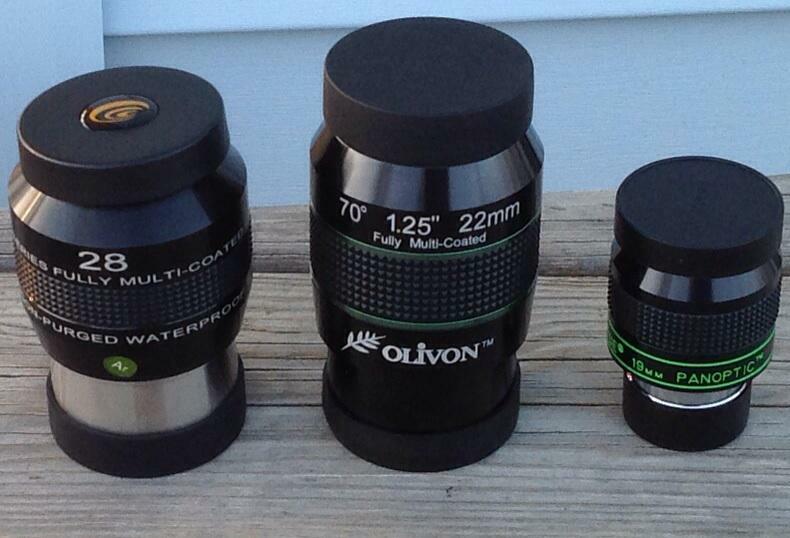 Even if it is the same basic optics, the Olivon's may be manufactured with better internal baffling and blackening, improved coatings, different glass types ... it is hard to say. They are removing the size label from future production. Does that make these "collector's items"?